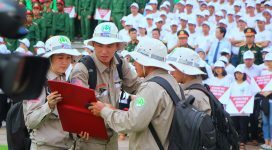 Khe Sanh, Quang Tri (21 April 2017) — More than 40 students from the primary school of Tan Long Commune, Huong Hoa District have recently experienced a lively and entertaining extra-curriculum activity at the former Ta Con Airstrip in Khe Sanh Town. 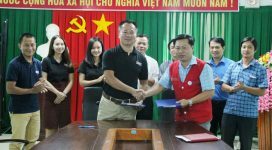 The activity was co-implemented by Project RENEW and Huong Hoa District Youth Union and school teachers. The students were taken to visit the historical relic which is located about 15km from their school. 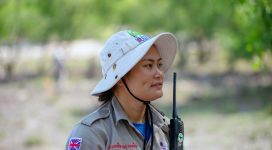 Through the visit, school children learned about the history and received instructions on how to avoid deaths and injuries caused by unexploded landmines and other munitions. Project RENEW’s Mine Risk Education Program is funded by the Irish Aid.